This new edition of Beat Dyslexia 6 completes this set of six books embracing multi-sensory and interesting activities aimed at improving reading, spelling and writing. Beat Dyslexia 6 is primarily targeted at students in Years 6 to 8. Help with skills that elude dyslexic pupils, such as telling the time, map reading and homework planning, is also offered. All the material has been trialled by students and teachers and is devised to be of immediate practical use in teaching sessions. It can be used by teachers, teaching assistants, tutors and parents working with small groups or individuals. Beat Dyslexia 6 is also suitable for use in colleges and responds to the needs of students who are undertaking Further Education. It is also well adapted for use as home-school liaison material. 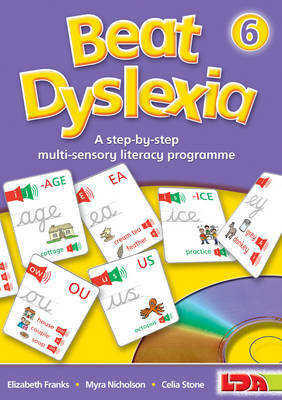 Beat Dyslexia 6 covers difficult spellings: -ice, -ace, ea, -sion, ou, -age, -ough, -our, ear, -or, -que, -cian, -us, -ar, -ey, silent b and k. Includes an audio CD and 30 illustrated reading cards. All the material is photocopiable for classroom use.